In 1998 Giovanna Aiello attended a course of ceramics, held by M.° Barbaro Messina, at the school of Glazed Lavic Stone in Nicolosi (CT). A lover of art and craft from an early age, she had no difficulty in learning the techiques of glazing and decorating of the "Etna Stone". 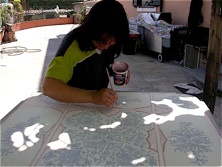 In 2005, after having acquired experience in various workshops in the province of Catania, she decides to find her own personal path in the world of pottery, notably in the glazing and decorating of Etna's Basalt, adding, to her already busy schedule of mother and wife, the role of full time craftswoman, and opening on the slopes of Etna, in the town of Mascalucia (CT) her own workshop. 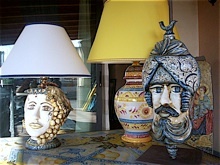 From that moment, she has participated in local and national manifestations, in the sector of artistic pottery, presenting her creations to a vast and demanding clientele, achieving an excellent response from the vast public and above all from behalf of professionals ( Architects, designers etc etc ). 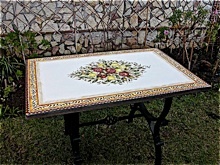 Since undertaking this path, she has faced not few obstacles, that luckily, she has always managed to overcome thanks to her self-abnegation but, above all thanks to the consent that people have shown in appreciating her crafts. This for her is a huge gratification that helps stimulate her in confronting difficulties every time they present themselves. Each time she gives herself a goal to reach and when she does reach it she realises that it is just the beginning of other goals to achieve. The colours she uses in her work are the results of intense research of our traditions, traditions that have made of Sicily a landmark, historical and cultural, for other countries. 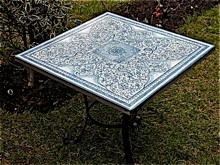 The main aim, of which Giovanna Aiello is extremely proud, is that of conveying in Italy and abroad, the Glazed Lavic Stone, in order to discover and rediscover our traditional crafts.